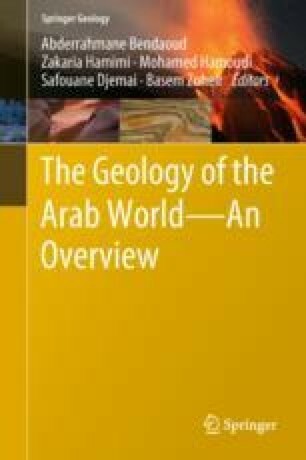 Remote sensing techniques are particularly suitable for geological studies in arid regions such as the Arab world. Here, we present an overview of the main applications of satellite sensors to geology for geological mapping, tectonic and structural geology, hydrogeology, mining geology, geoarchaeology, oil and gas prospection, earthquake and seismicity, landslides and coastal erosion. The main characteristics of the sensors are discussed. In addition, three examples of modern remote sensing imagery show geology in Arab countries: The Dead Sea Fault in the Middle East as seen with the large-scale ALOS PALSAR (ScanSAR mode) image, the Bou Azzer Anticline (Morocco) viewed by multispectral Landsat TM and the evolution of the coastal front in Nouakchott (Mauritania), monitored with multi-temporal Landsat data.